'Speed to the West', GWR poster, 1939. 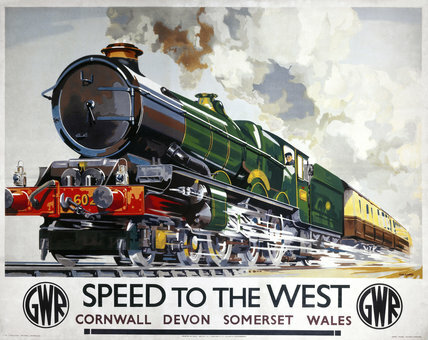 Poster produced for the Great Western Railway (GWR) to promote the company's speedy services to the West of England. The poster shows a 'King' class locomotive on a holiday train for the West Country. GWR published a book on the 'King' class, observing that 'Somewhere in the breast of every normal homo sapien there stretches a chord which vibrates only to the sight of a fine locomotive. Even now, with airplanes and motors to bid against it in its own field of romantic interest, the steam locomotive retains its fascination.' Artwork by Charles Mayo, who worked in the GWR publicity department and produced artwork for posters, booklets and other publicity material. 'Cheddar Gorge' GWR poster, 1923-1947.